A complete selection for use on hardened steels, carbides, ceramics and other hard materials; particularly adapted for dies, molds and most other shop requirements. Accurately graded diamond particles, with points exposed for best results, are metal bonded. Can be used at faster speeds and higher temperatures. 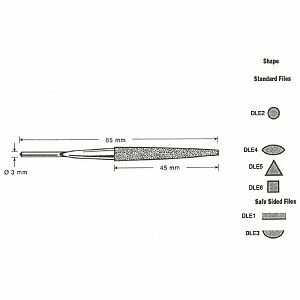 All Diamond files are Medium D151 grit. Files are 50mm / 2" OAL. Also available in CBN (100 grit) -Currently on SALE - Quantities Limited. .118" x .118" x .118"
Shape Flat - .197" Wide x .059" Thick Round - .118" Diameter Half Round - .197" x .079" Crossing - .201" x .086" Triangular - .118" x .118" x .118" Square - .098" x .098"